All Maltese know of the arrival of the Knights in 1530 and the Great Siege in 1565 but what of the years in between? 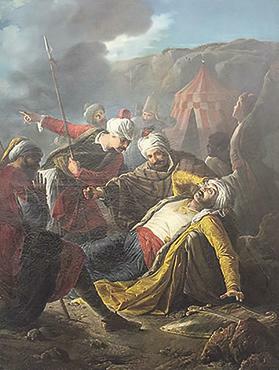 Giuseppe Calì’s oil painting Death of Dragut. A talk by Flimkien għal Ambjent Aħjar – about Dragut’s many piratical attacks on Malta before the Great Siege – will fill the vacuum in one’s knowledge. The talk, by Vincent Zammit, a researcher, author and expert tourist guide, will be held today at 6.30pm at the Phoenicia Hotel, Floriana. Zammit will also be talking about his book Assedju – Grajja ta Qlubija – 1565. Malta was always prey to pirate attacks throughout history. However, these raids increased with the arrival of the Knights of St John. Before the Great Siege of 1565, there were several such attacks on our Islands, bringing fear, destruction, loss of lives, as well as people taken off to slavery. One of the most devastating was the razzia of 1551 – known as the siege of Gozo. These are the events that led up to the more famous Great Siege. For tickets, visit https://ticketengine.faa.org.mt/ .